... when you finally understand how your pattern works without having to squint at the chart ... .
Today I'm working on some Aran. 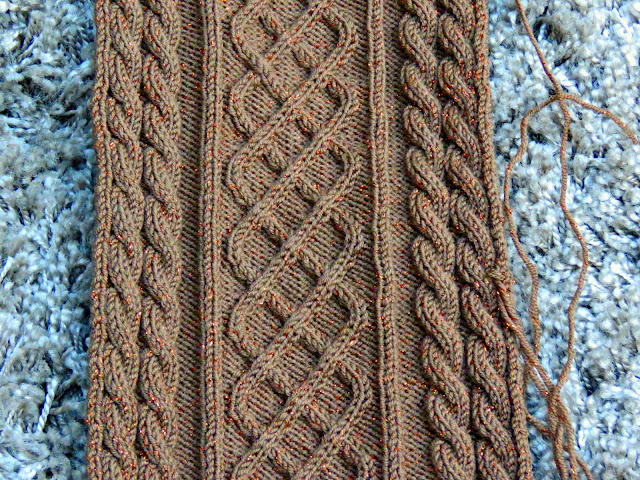 It's been a while since I've knit Aran, and I'm enjoying how the whole thing ties together. It feels very organic in its construction. I prefer not to use traditional Aran weight wool. It's just too bulky for comfort. I can understand how marvellous it must have been for the fishermen and the farmers working the land on the Aran Islands with the Atlantic winds buffeting them 360 days a year, but for us urbanites with our central heating and feather-down winter coats they're a bit too heavy. I prefer to use double knitting yarn. It takes more stitches and rows and, hence, more work, but the end result just seems to work better. I may also be historically more accurate in that preference than if I were using the Aran wool that's marketed for Aran knitting. For centuries the people on the islands have been knitting the Geansaí Árann, a gansey jumper with many of the cables and diamond patterns used in modern Aran knitting, but they used different construction methods and a finer wool. Aran knitting, as we know it today, was largely the creation of an entrepreneurial group of island women who set about knitting jumpers for sale to supplement their family income in the late nineteenth/ early twentieth century. Now as we all know knitting a jumper, especially an Aran one with all its intricacy of design, is a time-consuming business. And, if you're treating your jumpers as commodities for sale, time is clearly money. So they hit upon the brilliant wheeze of simplifying the construction techniques and using a much thicker wool that would knit up quickly, enabling them to produce more jumpers and up their earnings in the process. Thus the modern Aran jumper was born in a flourish of female innovation. And I've been innovating a teeny bit myself. How do you like my sparkly Aran? It looks better in person, but this wool is really difficult to capture. Maybe it's something to do with the light, courtesy of our miserable grey London weather. No wonder I'm reaching for a dash of sparkle ... .